High above Alssund are the monumental buildings that comprise the old German naval base. In about 1905, the Germans decided to move the Baltic navy from Kiel to new naval bases in Sønderborg and Flensborg. The move would provide better harbour facilities but was also to protect the sailors from the temptations of Kiel's harbour quarter. 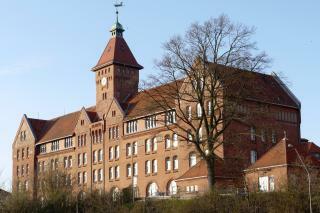 In 1905, building work began on two of the three huge buildings in Sønderborg. They were designed by architects Adalbert Kelm and Eugen Fink and combined the neat German castle style with Art Nouveau. A marine hospital followed in 1908-09. Today, the old naval base houses Sønderborg Barracks.